Can I specify my own encryption password for Zoolz? /Security and Privacy /Can I specify my own encryption password for Zoolz? Yes, you can, but only while configuring the backup. 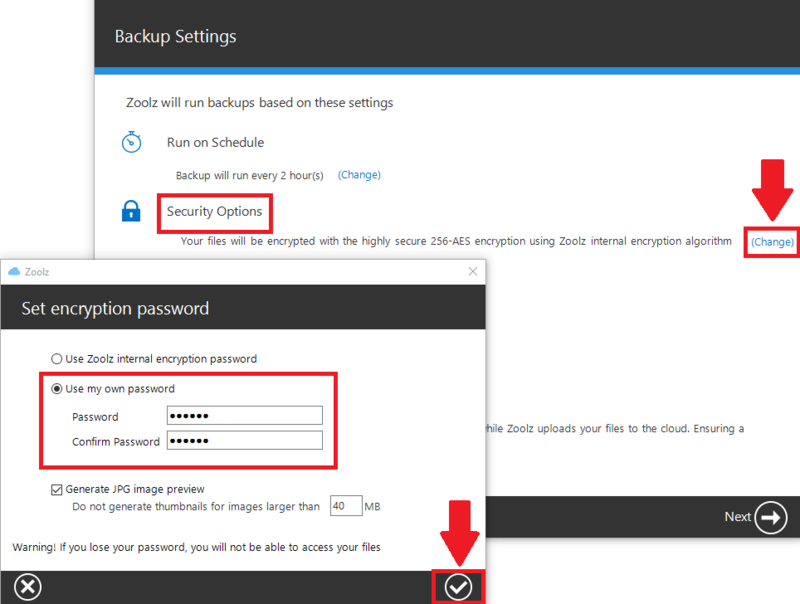 So, if you have already configured the backup without encryption, you must drop it and configure a new one again to set your own encryption password, by uninstalling Zoolz (Make sure the Keep Zoolz settings (Recommended if you want to reinstall) option is not selected) → Reinstall it and reconfigure your backup. From the Dashboard click the Download Zoolz button in order to download the latest setup file of Zoolz on your machine. 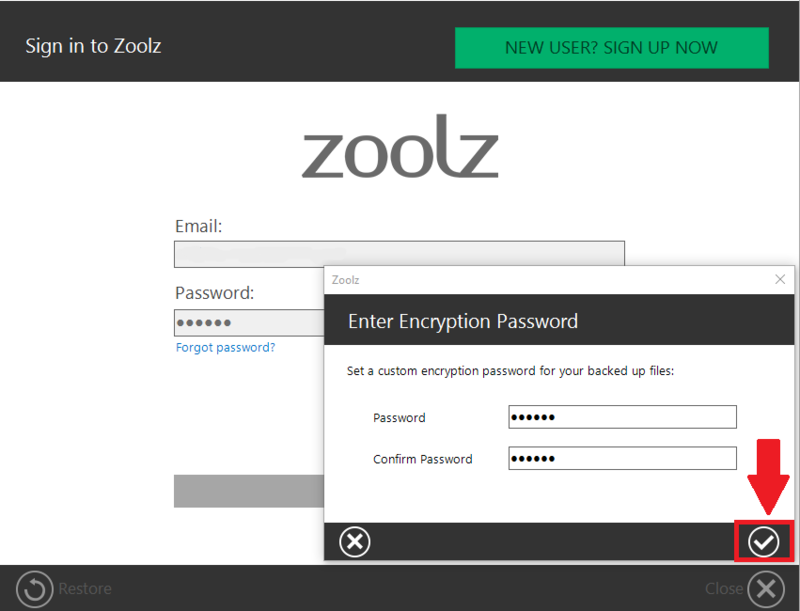 Once Zoolz desktop software is installed, it will ask you to enter your account credentials. Please do. Select the data that you want to back up, and click Next. From the Backup Settings window, click the Change option of the Security Options → In the new Set encryption password box, select the Use my own password option → Type your preferred encryption password and confirm it → Click the Save icon. Create a new policy or edit the existing one. 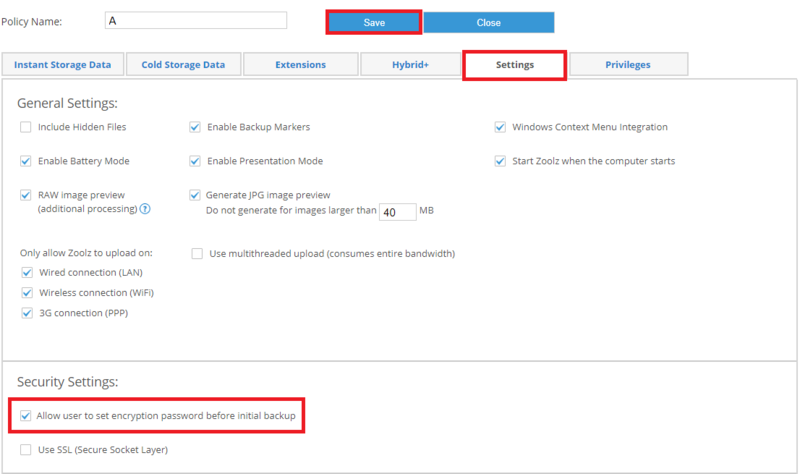 Under Security Settings, check the box next to the Allow user to set encryption password before initial backup option. An Enter Encryption Password pop-up window will be shown. Type your preferred encryption password there and confirm it → Click the Save icon. Important! Make sure to store your encryption password in a safe place since you will not be able to recover your files if lost. Can the admins access other users’ data?